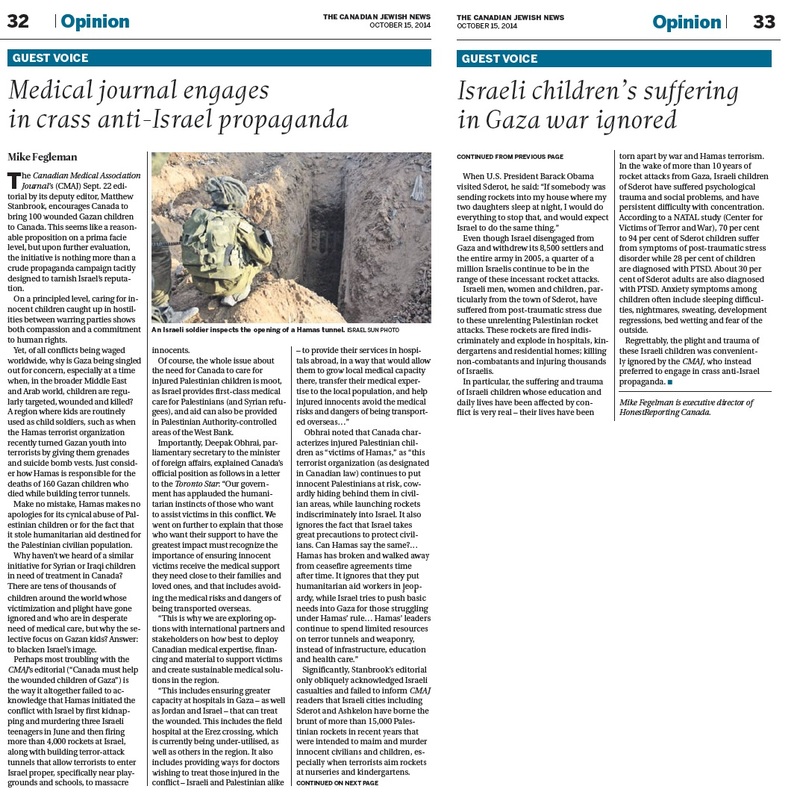 The Canadian Medical Association Journal (CMAJ) and its deputy editor, Matthew Stanbrook’s September 22 editorial encouraging Canada to bring 100 wounded Gazan children to Canada seems like a reasonable proposition on a prima facie level, but upon further evaluation this initiative is nothing more than a crude propaganda campaign tacitly designed to tarnish Israel’s reputation. On a principled level, caring for innocent children caught up in hostilities between warring parties shows both compassion and a commitment to human rights, yet of all conflicts being waged worldwide, why is Gaza being singled out for concern especially at a time where in the broader Middle East and Arab world, children are regularly targeted, wounded, and killed? A region where kids are routinely used as child soldiers, such as when the Hamas terrorist organization recently turned Gazan youth into terrorists by giving them grenades and suicide bomb vests. Just consider how Hamas is responsible for the for the deaths of 160 Gazan children who died while building terror tunnels. Make no mistake, Hamas makes no apologies for its cynical abuse of Palestinian children or for the fact that it stole humanitarian aid destined for the Palestinian civilian population. Why haven’t we heard of a similar initiative for Syrian or Iraqi children in need of treatment in Canada? There are tens of thousands of children around the world whose victimization and plight has gone ignored and who are in desperate need of medical care, but why the selective focus on Gazan kids? Answer = to blacken Israel’s image. 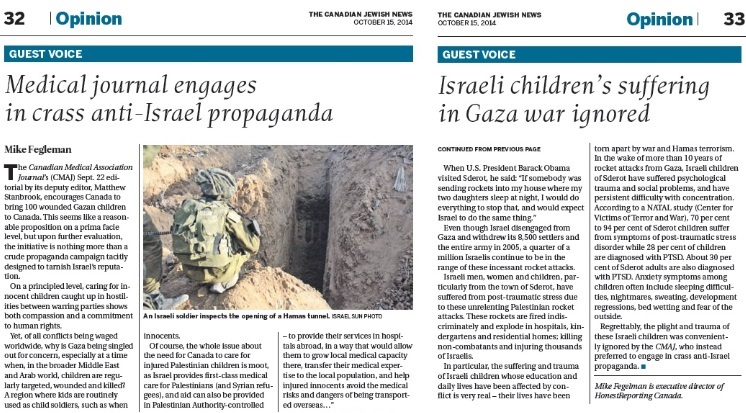 Perhaps most troubling with the CMAJ’s editorial (“Canada must help the wounded children of Gaza”) is how it altogether failed to acknowledge that Hamas initiated the conflict with Israel by first kidnapping and murdering three Israeli teenagers in June and then firing over 4,000 rockets at Israel, along with building terror-attack tunnels that allow terrorists to enter Israel-proper, specifically near playgrounds and schools to massacre innocents. Of course, the whole issue about the need for Canada to care for injured Palestinian children is moot as Israel provides first-class medical care for Palestinians (and Syrians refugees) and aid can also be provided in Palestinian Authority-controlled areas of the west bank. “… our government has applauded the humanitarian instincts of those who want to assist victims in this conflict. We went on further to explain that those who want their support to have the greatest impact must recognize the importance of ensuring innocent victims receive the medical support they need close to their families and loved ones, and that includes avoiding the medical risks and dangers of being transported overseas. This is why we are exploring options with international partners and stakeholders on how best to deploy Canadian medical expertise, financing, and material to support victims, and create sustainable medical solutions in the region. Importantly, Mr. Stanbrook’s editorial only obliquely acknowledged Israeli casualties and failed to inform CMAJ readers that Israeli cities like Sderot and Ashkelon have borne the brunt of over 15,000 Palestinian rockets in recent years which were intended to maim and murder innocent civilians, children especially when terrorists aim rockets at nurseries and kindergartens. When U.S. President Barak Obama visited Sderot he said that: “If somebody was sending rockets into my house where my two daughters sleep at night, I would do everything to stop that, and would expect Israel to do the same thing.” Even though Israel disengaged from Gaza and withdrew its 8,500 settlers and entire army in 2005, a quarter of a million Israelis continue to be in the range of these incessant rocket attacks. Israeli men, women and children, particularly from the town of Sderot, have suffered from post-traumatic stress due to these unrelenting Palestinian rocket attacks. These rockets are fired indiscriminately and explode in hospitals, kindergartens, and residential homes; killing non-combatants and injuring thousands of Israelis. In particular, the suffering and trauma of Israeli children whose education and daily lives have been affected by conflict is very real, their lives have been torn apart by war and Hamas terrorism. In the wake of over ten years of rocket attacks from Gaza, Israeli children of Sderot have suffered psychological trauma, social problems, and have persistent difficulty with concentration. According to a NATAL study (Center for Victims of Terror and War), between 70% to 94% of Sderot children suffer from symptoms of Post Traumatic Stress Disorder while 28% of children are diagnosed with PTSD. About 30% of Sderot adults are also diagnosed with PTSD. Anxiety symptoms among children often include sleeping difficulties, nightmares, sweating, development regressions, wetting beds, and fear of the outside. Regrettably, the plight and trauma of these Israeli children was conveniently ignored by the CMAJ who instead preferred to engage in crass anti-Israel propaganda.